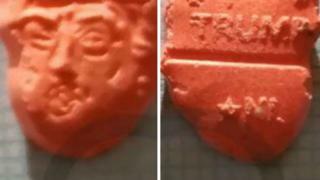 Orange-coloured drugs shaped like Donald Trump's head were tested at Bestival and found to contain more than two doses of MDMA. Not-for-profit company The Loop provided a drug testing service to people who managed to get substances past security at the Dorset festival. It said the tablets, which had "Trump" stamped on the back, contained more than 250mg of MDMA. Others have been tested in Europe with different strengths. The Loop said though some pills look similar "you can't know the strength from looking". Bestival, which held its annual event between 2-5 August, said it had warned revellers of the dangers of the "Trump" drug via social media once it became aware it was on site. Organisers said about 440 tests were carried out during the festival and 880 one-to-one consultations undertaken. These resulted in an estimated 20% of people handing in tested substances and a further 40% reducing their intake, they added. A spokesman said this year's event saw a reduction in crime and drug offences and described the drug testing as a "positive step". The Loop aims to reduce drug-related deaths by revealing the strength of the drugs it finds. The festival moved from the Isle of Wight to Dorset's Lulworth Estate last year, which is where 25-year-old Louella Fletcher-Michie, the daughter of Holby City actor John Michie, died after taking drugs. Two people also died at Portsmouth's Mutiny festival in May, with their deaths blamed on a "dangerous high-strength or bad-batch substance" by festival organisers.